When we got up the next morning, I was not feeling great, but I figured it was just a bit of jet lag and I would be just fine after coffee and, well, Paris! Today we decided to do a tour that I had purchased from the Girls Guide to Paris. You can find the information here. These apps are a steal at around $5 per theme! We had decided to do the Stroll for St.-Germain to the Louvre. It is advertised as a 2-3 hour walk from the 6th Arrondissement to the 1st Arrondissement. There are 11 points of interest in this mobile tour and can be done any time, day or night. 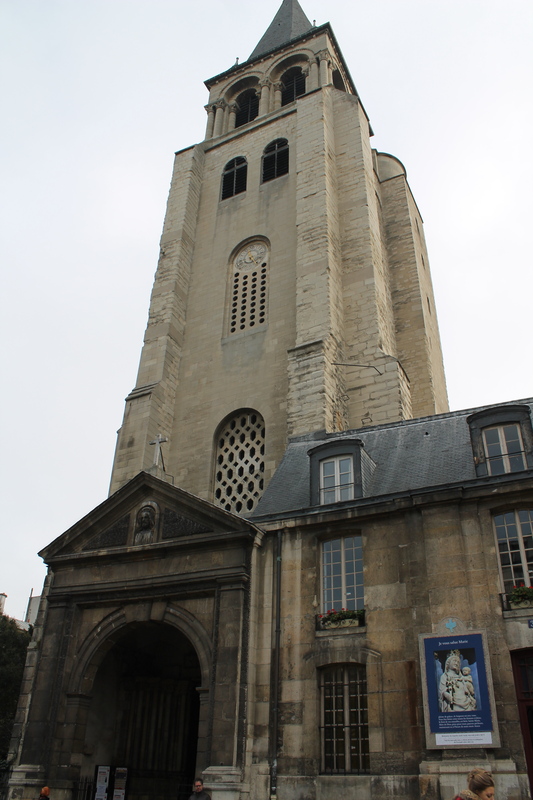 The first stop is at rue Bonaparte and blvd St.-Germain across from the Eglise St. Germain. I had never really been on this side of Paris and I was very excited to see yet another part of Paris I had not seen before. After 3 trips to the City of Lights, I have still not seen all I would like to see and it remains one of my top travel destinations. 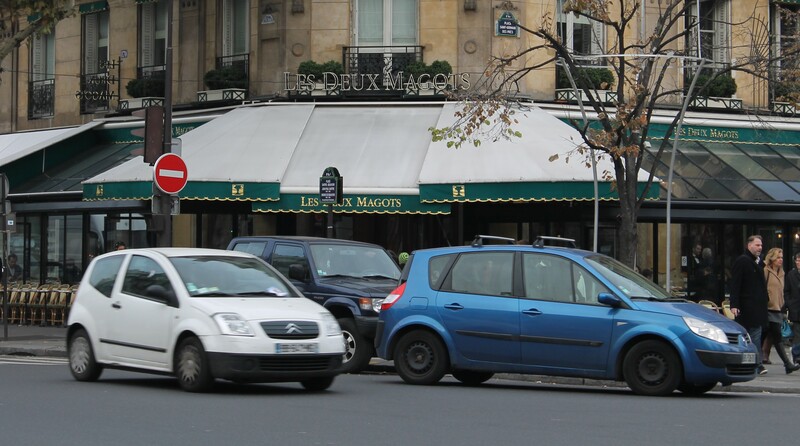 The Girls Guide tour next moves to Les Duex Magots cafe. It is a super famous, super expensive tourist trap. Once the hangout of young intellectuals, artists and writers such as Hemingway, Picasso, James Joyce, it is now really just a place to go to get the stereotypical snooty French service and over inflated prices. Still, I was glad I saw it, even if we didn’t go in. 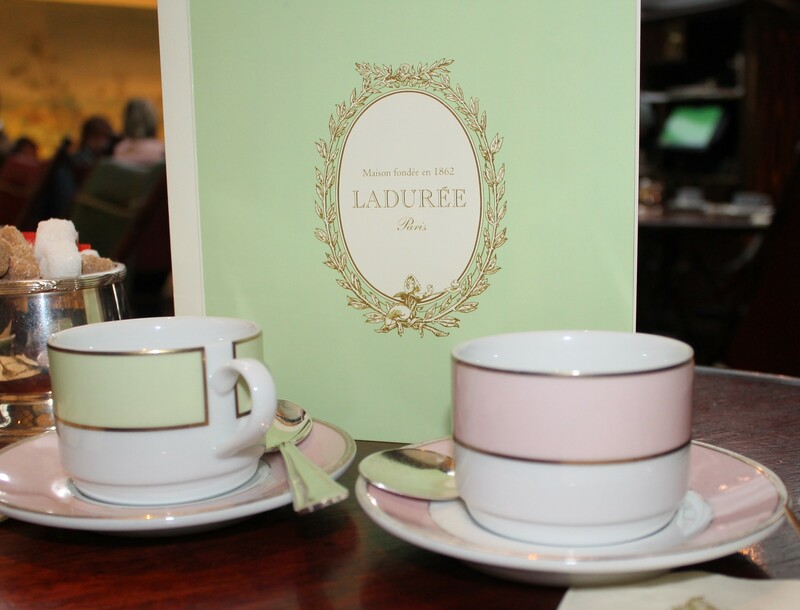 Our next stop on the tour was the equally famous Ladurée. This pastry shop is world famous for its macarons, in fact Ladurée’s grandson is credited with inventing the famous treat by being the first to stick two of the crispy, delicious shells together with a decadent ganache filling! This same forward thinking grandson also opened a tearoom at the pastry shop. This was important because in the early 1900’s women were not allowed in cafes, so this made it a hit with Parisian ladies who could now socialize here instead of only at their homes. As it was my mothers birthday this day, we decided to eat in the tearoom. The walls are beautifully painted with exotic garden murals, meant to evoke a feeling of being in Bombay. Even though this particular location was not built until 2002, it was easy to feel like you had stepped into the 1930’s and were meeting the ladies for tea. Keeping in mind that I still did not feel fantastic, I decided to try and settle my stomach with a heavy dose of carbs. The menu had plenty of options for any appetite. We could have ordered breakfast or lunch, sweets or savory dishes. Yes, the prices are expensive compared to less touristy places we could have eaten, but still…its Ladurée! 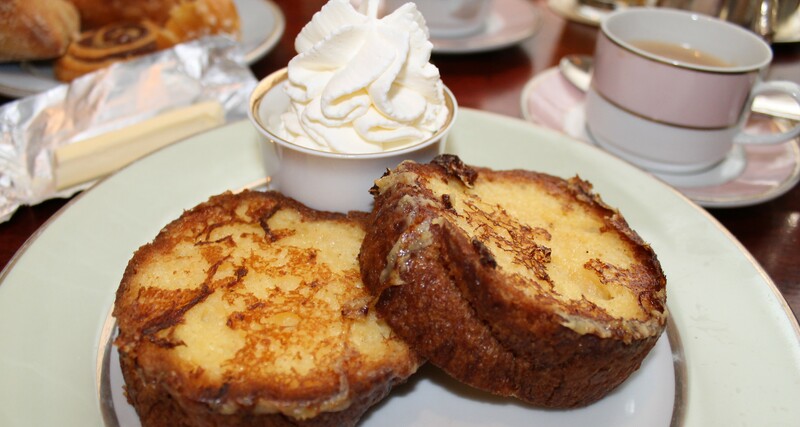 I ordered the pain perdu, which could have come with a variety of toppings from fruit to chocolate. With my still delicate tummy, I opted for just some crème Chantilly on the side. When this dish came, it was certainly beautiful…but the real treat was the first bite. Oh My Sweet Goodness!!! This was fantastic!!! Even as terrible as I felt, this was a little bit of heaven, and I felt a little better while eating. Alas, it was not to last! Now properly fortified and able to say that we had eaten at the famous tearoom, we continued on with our tour. The streets are narrow and not heavily traveled by cars so walking was never an issue. Since the sidewalks are so small, we often found ourselves walking single file instead of next to each other. Because we are chatty people, walking in the street remedied this! Rue Jacob has a billion precious little shops. They are not touristy souvenir shops either but antique, art and book stores as well as design and furniture shops. We followed the Girls Guide tour and took note of all the little places mentioned in the tour, really a great bit of information that we never would have learned of without the app. 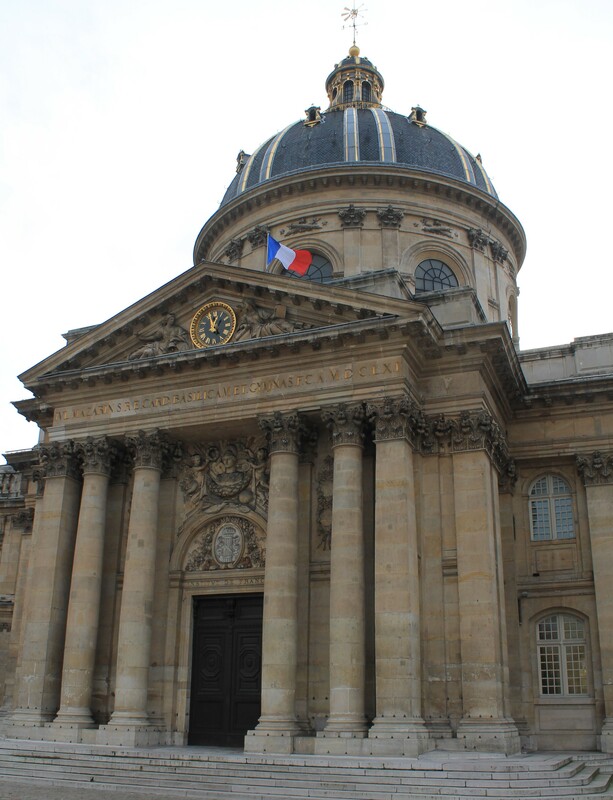 Then, as the tour suggested, we ducked through the small porthole doorway after rue Mazarine and came out in the impressive courtyard of the Institut de France, a learning society grouping five académies including the Beaux Arts and the Académie française. Exiting the quaint cobbled streets into this courtyard feels a bit like a secret passage from the past to the present. It almost took me by surprise, which I thought was awesome! After the impressive Académie, the instructions now say to cross the Seine via the über trendy Pont des Arts. This pedestrian bridge is hugely popular and serves as an open air studio for painters, a popular New Year’s Eve destination, and a romantic picnic stop for couples. 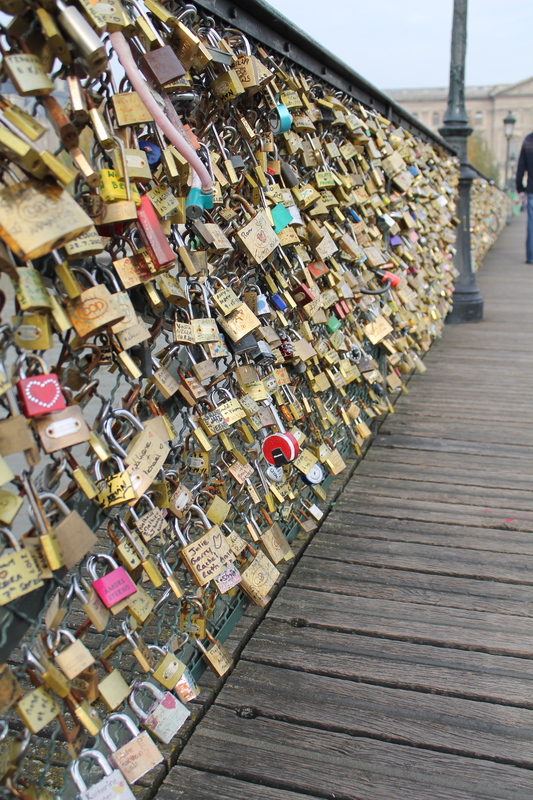 This bridge is so romantic, in fact, that couples have taken to engraving a padlock with their names, locking it on the railing of the bridge and throwing the key into the river to show their commitment to each other. I can only imagine that soon we will hear stories of a river cruise that ran aground on a man made reef of padlock keys. I get the sentiment, really I do. But if you ever leave your padlock there for all to see, do me a favor and just throw the key in the trash! 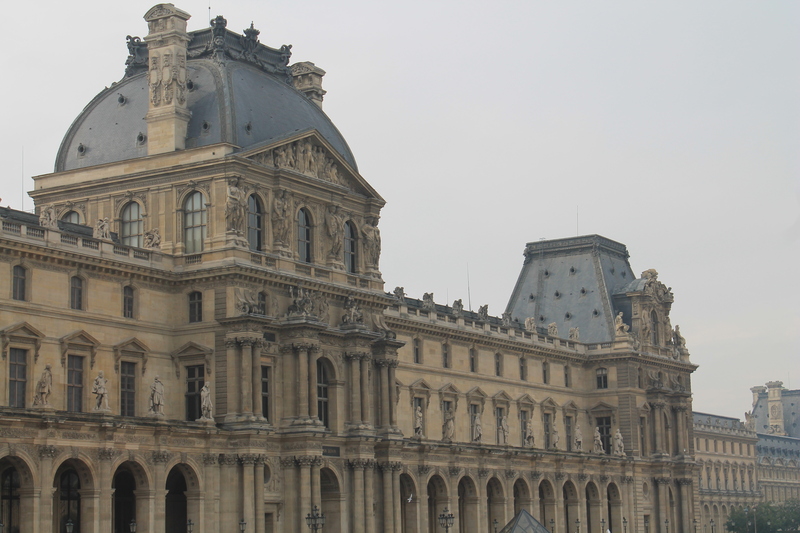 As I mentioned before, even after three trips to Paris, I have not done all that I would like to do and the Louvre is one of those things. I have never been further in than the gift shop. I suppose someday I will, but as far as I am concerned, Paris is a living breathing museum on its own. 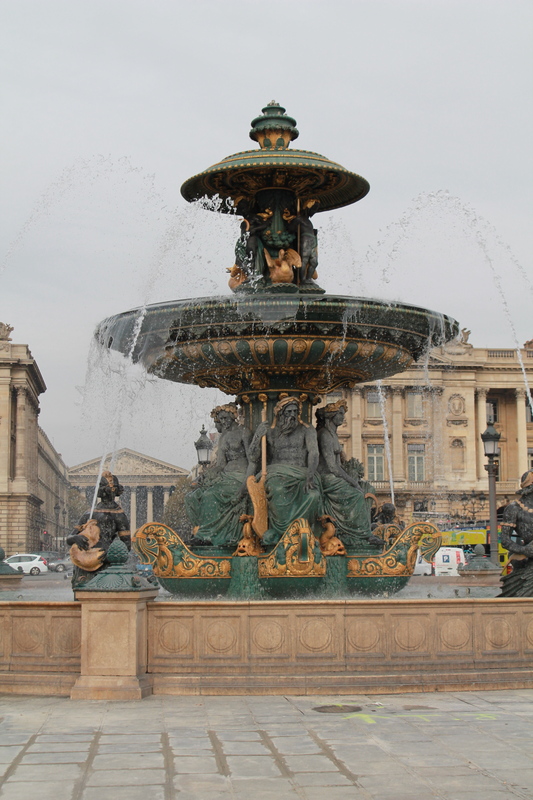 After a quick stop in some of the Louvre shops, we continued up Rue de Rivoli towards Place de la Concorde. The girls guide tour suggests making this trek via the Tuileries, which is a fantastic idea and one I have done many times. If you do go this way, beware of gypsies. They can be aggressive and sneaky. I have been approached twice and managed to escape both encounters unscathed and with all of my possessions, just be careful and aware. This time we decided to walk on the street in order to get some of our shopping done though. 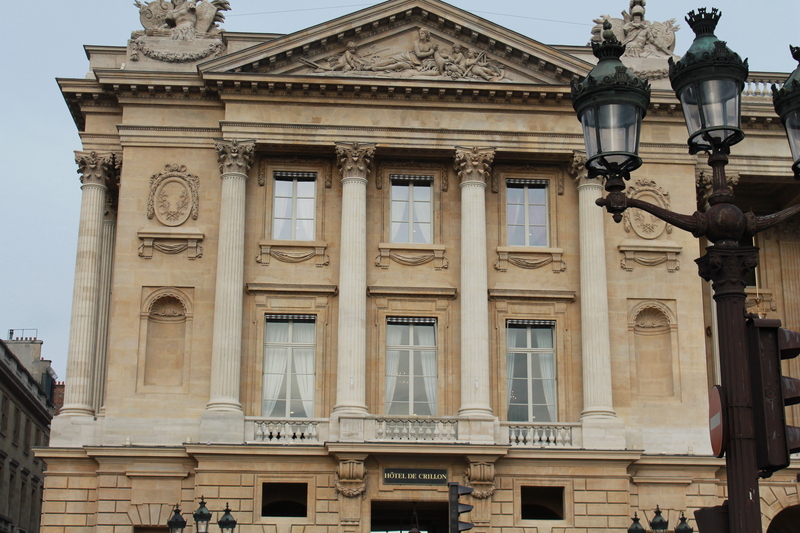 The last stop on the Girls Guide tour is the Hôtel de Crillon. This hotel is one of the best in Paris and even if you can’t afford to stay there, you should try to stop by the bar or the gift shop if you can…you can’t until 2015 due to renovations, but you should. The day that we were there some celebrity must have been staying there because the paparazzi around the front door was unbelievable so we were not able to get anywhere near the place. Even if you can’t get close to the Hotel, you still find yourself in the Place de la Concorde. One of my favorite places in Paris. This is where Marie Antoinette was publicly beheaded, among thousands of others. This is where the German High Command set up shop during WWII. This is where the Avenue des Champs-Élysées begins (or ends, depending on your perspective). The sheer volume of history in one octagonal park is mind boggling. The fountains are exquisite, the Luxor Obelisk is a marvel to behold, and the traffic whizzing around the square will get you killed in a New York minute if you aren’t careful! This is where we ended our day and headed back to our apartment…and just in time as it turned out!